StoneWords engraved stones make unique and personalized wedding favors and customized wedding gifts. If you are looking for the perfect wedding favor for your guests, look no further! 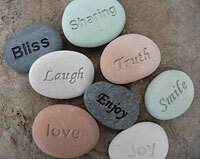 Stonewords engraved stones make the perfect wedding favor to commemorate your special day. These natural river stones come in many sizes and colors, including pastel green or terracotta, white, black, gray or an assortment. We are also one of the only companies that encourage two-sided, custom engraving. Give your guests a wedding favor that will be as unique as your wedding! 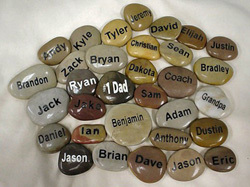 Engraved Stones last a lifetime and have a variety of decorative uses. You have probably seen engraved stones decorating gardens in your neighborhood or serving as business card holders, soap dishes, or massagers. Personalizing a large stone with the wedding couple's new last name and the year of their marriage, or with a message about love and marriage is a great way to show how much you care. Where would you find such a unique wedding gift? Right here at Stonewords.com, we offer custom engraving on unique semi precious, polished and unpolished stones. Semi precious stones are multi colored and highly polished. The river stones are naturally earth toned and come unpolished. For orders of 50 or more, please call 973-948-0085! Easiest and fastest way to order is to call Jennifer at 973-948-0085 for truly personalized service. StoneWords has by far the nicest selections and the best prices for truly quality engraved stones and gifts that last a lifetime. Engraved River Stones, natural, unpolished, 1.0" wide, available in stone colors of gray, white, pastel green, pastel peach or a mix of colors. 5 letter limit for this size stone. For orders of 50+, $3.00 each for 1 side engraving. River Stone, natural, unpolished, 1.5" wide, available in stone colors of gray, white, pastel green, pastel peach or a mix of colors. For orders of 50+, price is $3 each. River Stone, natural, unpolished, 2" wide, available in stone colors of gray, white, pastel green, pastel peach or a mix of colors. For orders of 50+, price is $4.50each. River Stone, natural, unpolished, 3" wide, available in stone colors of gray, white, pastel green, pastel peach or a mix of colors. For orders of 50+, price is $7.95 each. Polished River Stones are 2"- 3"wide & priced by the quantity of letters/quantity purchased. Colors are black, white, red/rust, yellow, tan, brown, amber & gray and cannot be chosen. 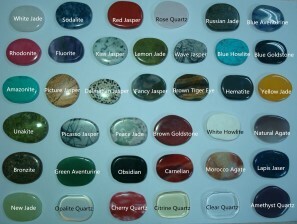 Semi-Precious Gemstones measure 1.75" wide and come in 35-40 different colors, based upon the stone types (see chart). They are priced by the quantity of stones purchased. For orders of 50+, price is $3.00 each.